Indeed, blog shorten the distance between the person in that magazines and those who are reading the magazines. Is this one of Web 2.0 concept? such a celebrity! watch out for the paparazzi on your next bike ride or jog! What is the name of the magazine and the title? More about it please. 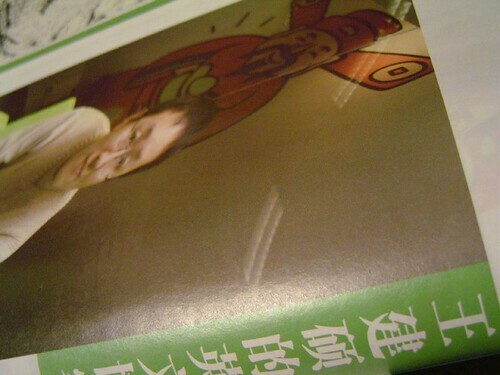 The first (keso’s picture) should be the 21st Century Business Review （二十一世纪商业评论）, a very expensive magazine (from the normal people’s view) – 18 RMB per issue. 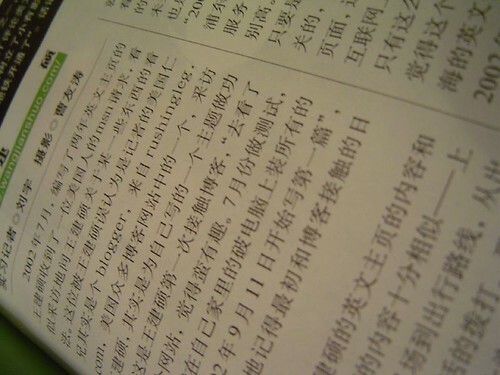 The later is “三连生活周刊”, or the Sanlian Life Weekly. This guy is way too much into himself. His blog is basically a propaganda machine, always good things about Shanghai and himself. Where is the information about the big anti japanese protests in Shanghai? Avian flu? Skype blocking by the government? Why is it wrong to discuss all this here? If all you are going to talk about are good things, I might as well read some government propaganda. btw i was a big fan of this blog before the total censorship of the anti japanese protest (although there was one “rosy” report of the protest after some complaints by readers here). Sure, I dont have to read this if I dont like it and I intend not to. I suggest, go to Shanghaiist website if you need good solid and no holds bar information about Shanghai. Mr. Wangjiashuo, do you 畅所欲言 today? Peter: this blogger actually knows nothing about the soul of the city he had moved in to seek fortune. In this blog, some part of reality was left out due to his self-censorship, like you had pointed out; other omissions are simply out of his own ignorance. It’s not easy to find out, that despite its tragic falling into the hands of communists in 1949, Shanghai still retains some Old World glory in its architecture and culture. Yet you’ll never read a bit of it in his blog. For a crass nouveau riche such as wangjianshuo, Shanghai’s past has never existed. I pity this great city, for it is now represented in blogsphere by such a redneck, who cares everything about serving his communist master but nothing about history and heritage. Please do not step on garbage or produce garbage here. This post seems too much to worship yourself. Haha. It seems so – some kind of “cult of personality”. Sorr for that. Just want to make fun when I saw keso posted the pictures onto his Flickr. What a surprise and I want to echo to Keso’s effort to take the pictures and especially adding a tag – what a great tool for people to find things since searching wangjianshuo in technorati.com and these pictures comes out. Yes. 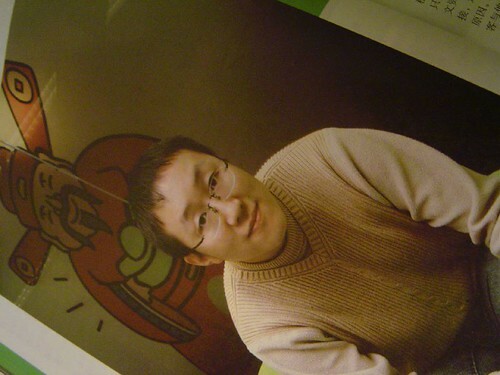 The pictures are too big – I even got red face when seeing that. I know this is your personal blog, Jianshuo. But, it is obvious that you are a kind of an official person already. Just see the bottom of this page, you wrote that. Sounds like advertising ! No need for that, as your readers know you well. Modesty is the rule for real heroes. As you are living in Shanghai, postings could be more critical to be of help to outsiders visiting this town. Not only good things, but bad as well. You have the chance to view the city with other eyes than born citizens of Shanghai, as you are a “foreigner” from outside of Shanghai (just like most of us readers). So, Peter and Bellevue has some points, I think ! Maybe start a new blog besides this ? Your comment is very welcome, Jianshuo !